Despite of the non-stop reminder from the media, from our bosses, from our parents and from our friends to go home early because of the coming super typhoon Pepeng (Perma) last Friday, the middle child stubbornness in me kicked in. Honestly, when my stubbornness kicks in, especially when it comes to craving for a food, I can’t do anything but to follow what my taste buds command. 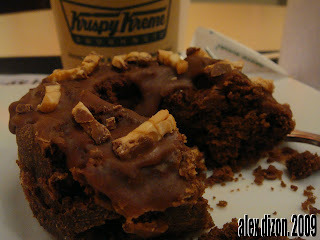 Adding my sweet tooth, oh, gosh, I definitely need some chocolates to satisfy this craziness. Lols. 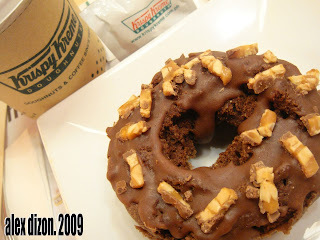 So, without further ado, I went straight to Krispy Kreme, my NEW nirvana, and have a quick bit of their uber yummy and oh-so-chocolate-y Snickers doughnut, and one hot and smooth coffee for my nerves. 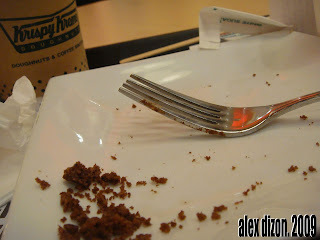 What’s so nice about my idea is that when I went there, there were only about five peeps who were dining at KK. I didn’t had a hard time finding a perfect place for my “me, myself and I” moment. 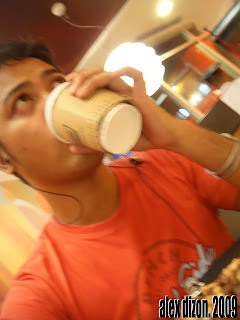 I stayed there for quite a long time, sipping my hot coffee and enjoying this new offering from KK, an offering that I really enjoyed. It so comforting, relaxing my mind from a busy week that I’ve been to and “slightly” escaping from the tragic problems that the country is facing now, this place is really a Nirvana (especially when you are working in Makati *wink*). I believe that a little break from these depressing scenes wouldn’t hurt that much. After all, after this break, I’m sure that I cannot help but to lend my extra pair of hands to those who are still in need. I just hope and pray that we may all step up from this tragedy, learn from it and a have fulfilling, safe and prosperous life ahead. By the time I arrived in our house, the news is already flashing that Typhoon Pepeng (Perma) took a different route and is about to spare Metro Manila from its catastrophic wind and water. Shet, ang sarap naman! Penge!